Hair transplant surgery has made a major impact in the world and many people are looking for the best in this field. Sadly, not everyone has a quality hair restoration clinic around the corner from their home. This is why we receive phone calls from people all across the United States. People have called us from neighboring states like Nevada, Arizona, Oregon, Washington, New Mexico, Colorado and Texas. Many more have called from the Mid-States to as far as the east coast cities like Albany and New York (NY), Manchester (NH), Boston (MA), Springfield (MA), Providence (RI), Hartford and New Haven (CT), Newark (NJ), Baltimore (MD), Richmond (VA), and Washington (DC) to get the best hair transplant surgery with the updated hair restoration techniques. Our Dubai hair transplant office will be active shortly. We will announce the begining of our UAE office through our news letter and websites. Please contact us to register for our Dubai hair transplant waiting list. 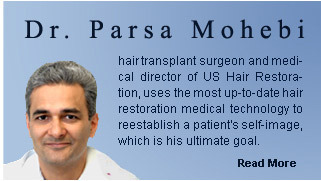 Patients can also finish an online hair transplant consultation before being seen by Dr. Mohebi in Dubai. To get started only fill the mini form on the right side of the page and we will get back to you as soon as possible. Many hair loss patients looking into getting a hair transplant may feel and believe that just because they are in a different part of the United States means that we can’t offer them the quality hair restoration services they deserve. We’ve worked long and hard to make sure that we can figure out ways to help our patients save. We’ve come up with payment services offered through financing companies and even designed additional affordable hair transplant programs for patients traveling long distances from home. Hair restoration has advanced so much that these procedures can now be provided at a fraction of the cost and the down time is very limited. Hotel and transportation to and from the hotel is provided by US Hair Restoration for everyone who has to travel over 50 miles to get to one of our hair transplant clinics.